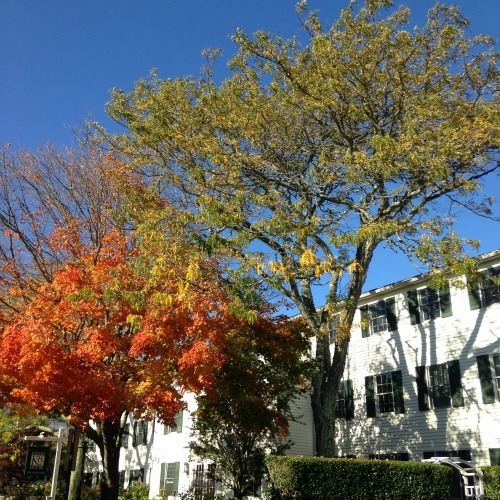 Fall foliage in downtown Edgartown. I was in Martha's Vineyard last week for work, around the MV Food & Wine Festival, of which the magazine is a media sponsor. The weather was perfect fall days for running around and visiting with clients. A highlight was checking out The Port Hunter in Edgartown for a quick bite and glass of wine at the bar. I want to go back just to try more on their menu! I stayed at The Victorian Inn in a great location in Edgartown. This cute set-up greeted me when I arrived. A gorgeous & patriotic scene from Memorial Wharf in Edgartown. A cheeky, fall display at Granary Gallery in West Tisbury. Couldn't not peruse my favorite store in Edgartown. I didn't hate having 2 client meetings in 1 day at Rosewater in Edgartown (and don't hate this branding!). Still waters at Edgartown Memorial Wharf. 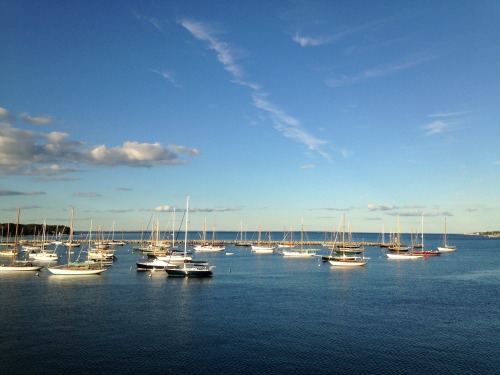 A pretty view from the Vineyard Haven ferry. PS: Last year on the Vineyard. All photos by me and always you can follow my travels on my Instagram. Gorgeous! I've never been to MV in the fall, but it seems like it would be a nice change from the summer crowds. I'll have to keep that in mind for when I'm home next.